Tonight, I had a little free time while waiting for my wife to get out of a Town Council meeting, so I watched the CCHS Freshman Basketball Team play John Glenn. I was hoping to watch more, but a Council meeting two nights before Thanksgiving generally means the schedule is light, so I was called early to pick up my wife. 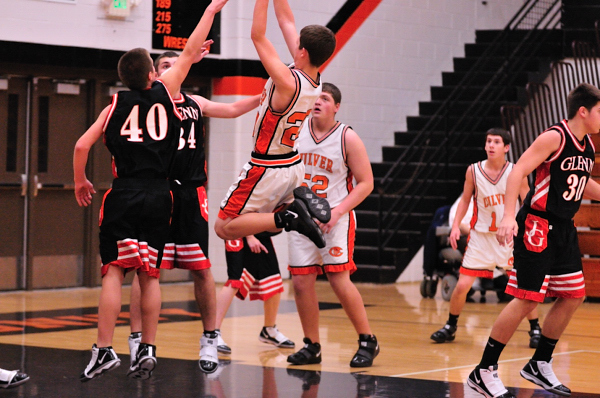 The Culver Cavaliers played well. At the half, Culver was trailing, but I don’t know the final outcome of the game, as I had to leave. I hope they continued to play hard and closed the gap. I’ve posted a few photos here; there are more at www.culverphotos.com. 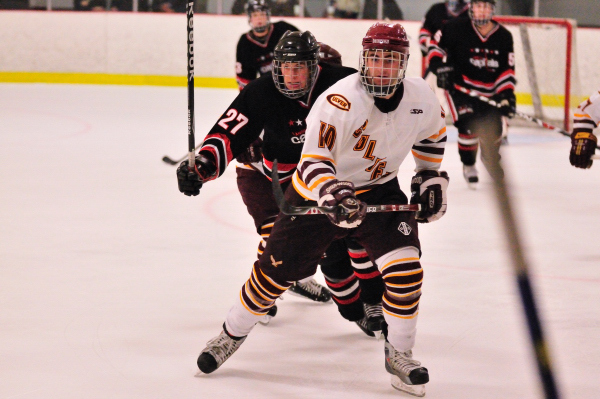 After defeating the Lansing Capitals hockey team last night 5 to 1, the Culver Prep hockey team did not do as well today. They lost in a close, hard faught game. The final score was 3 to 2. The game was fast paced with some excellent plays, though the Lansing Capitals proved to learn from their mistakes from the previous night. I’ve posted some of my favorite photos here, but please www.culverphotos.com for more photos from this game or other Culver Academy photos and hockey games. Today, I took photos of Culver Academy’s Boy’s Varsity Hockey team as they played the NW Chargers. This was the second match up of these teams during the weekend, though I was shooting a different hockey match last night when they played. As an observer who has never played hockey, I’m not the best judge of whether a team is playing well or not. Unfortunately, the team lost by more than a couple of points. I still managed to get some great shots using my new D300s that I purchased a couple of days ago. 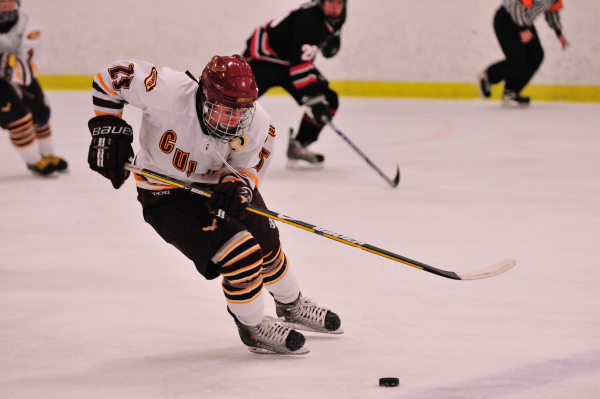 I’ve posted my favorite photos here; there are more hockey photos and Culver photos at www.culverphotos.com. This evening Ginny and I were informed that we were winners in a local photogoraphy contest that is part of The National Endowment for the Arts “The Big Read” project. I won the top prize for ”Best Overall.” It is for a photo called “Along a Country Road,” which I shot a couple miles out of Culver during one of our outings. 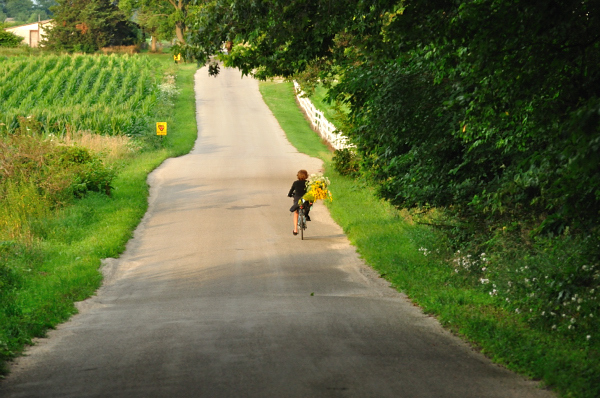 We were driving along when we came across a woman riding a bicyle who had just picked some wild flowers to take home. Ginny asked her if we could take her picture, which she graciously said we could, so I shot her riding away from us. Ginny won first place in the “People” category with a picture of our niece titled “Butterfly Hunting.” Ginny loves to take pictures of kids, and I think this one represents how patient she is when taking “just the right shot.” Lucy is always on the move, but she has given Ginny many opportunities and is her favorite subject. Thanks to those of you who support our efforts. We are thrilled to be recognized for some fo the photos! Culver Academy photos. What’s there not to love? It is much more enjoyable when Culver plays strong and wins. Tonight, for the second game of the evening (actually it was the 4th, but I’ve yet to figure out how to be in two rinks at the same time), the CMA Prep Team played the Lansing Capitals. The enitre game was dominated by the CMA Eagles who played well as a team and showed some great passing skills. The final score was Culver-5 and Lansing- 1. I’ve posted some photos here, but you can find over 100 more at www.culverphotos.com. 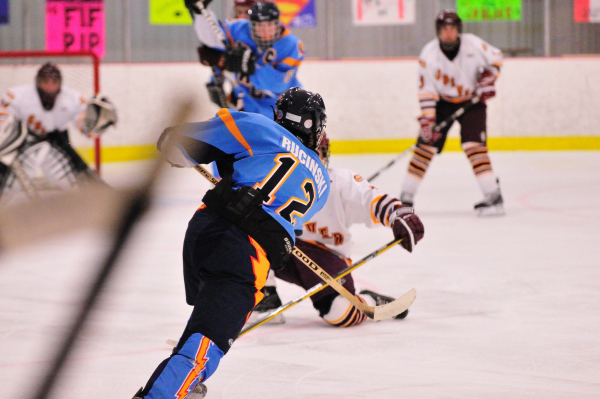 Today, I shot photos for the Culver Academy Girls U19 Hockey Team; they played against C.Y.A. It was a great game. The CGA team took an early lead that they held the entire game. 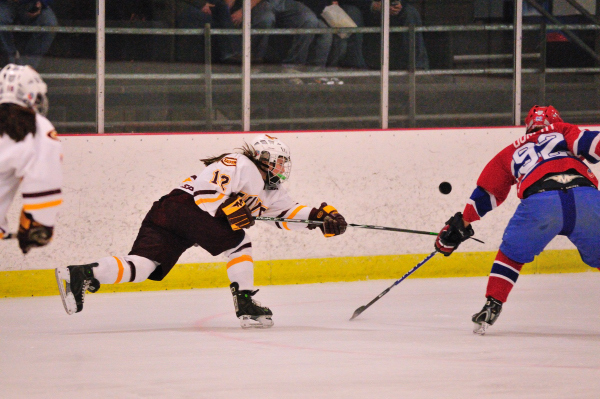 The girls did better than the last game that I shot at staying out of the penalty box, which was a key facor in winning the game. The final score was Culver- 3, CYA-2. I’ve posted some photos here, though there are more located at www.culverphotos.com. 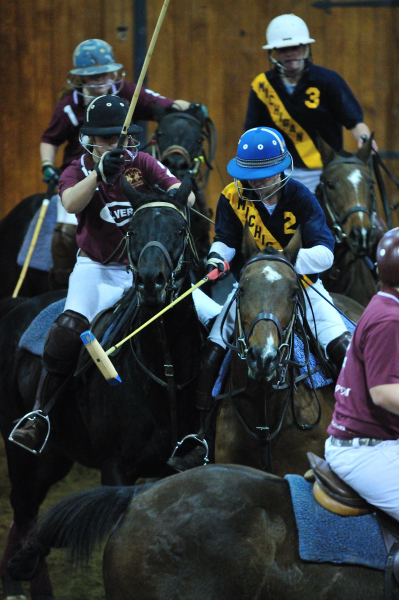 Another exciting polo game on Culver Academy’s campus. This morning, the CGA Varsity Polo team played a second game against the women’s polo team from the University of Michigan. It is a fun game to watch though unlike last night’s game, the CGA Eagles didn’t do as well. The University of Michigan team started strong and took an early lead that the Eagles never came back from. I think the Eagles took a few minutes to get into their groove, whereas the Michigan team started with theirs. The final score was Culver-9 and University of Michigan- 12. I’ve posted some photos here; you can find several more at www.culverphotos.com. Polo is back! For those who don’t know me, I was in Troop A when I attended Culver Academy. 20+ years later, I’m still a trooper at heart and love photographing horses. 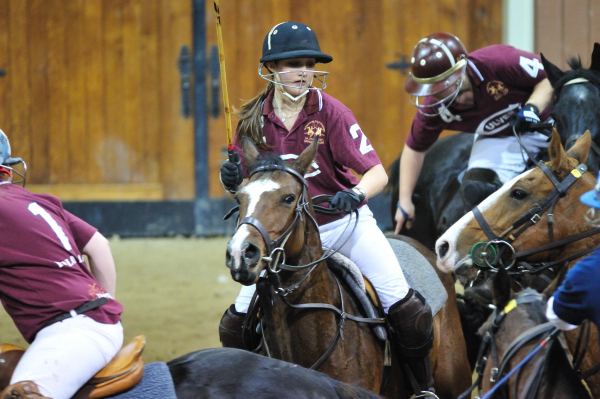 Tonight, the CGA Varsity Polo team hosted the girls polo team from the University of Michigan. Adding to my excitement of being a Friday and the first Polo game of the season is the fact that I shot tonight using a brand new Nikon D300s that arrived today. I was an anxious mess all afternoon waiting for the game. Just ask my wife. I couldn’t sit still. Both teams played well with the CGA team taking an early lead, which they held the entire first half. During the second half, the University of Michigan team dominated. They held the lead until half way through the 4th quater. The Culver girls came back and ended up winning 11 to 9. I’ve posted some photos here; you can find several more at www.culverphotos.com. 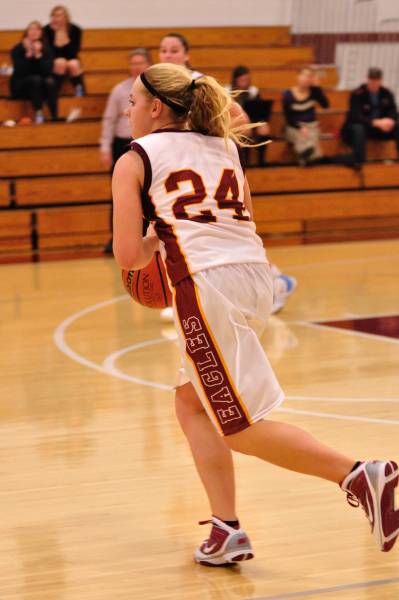 Tonight, I photographed a scrimmage between Culver Acadmey and St. Joseph High School’s Varsity Basketball team. I must say, I have a lot to learn about how scimmages are played. I watched four periods and left confused as I didn’t know if anyone won because the score was reset to zero at the end of each period. I posted some photos here; there are more at www.culverphotos.com. 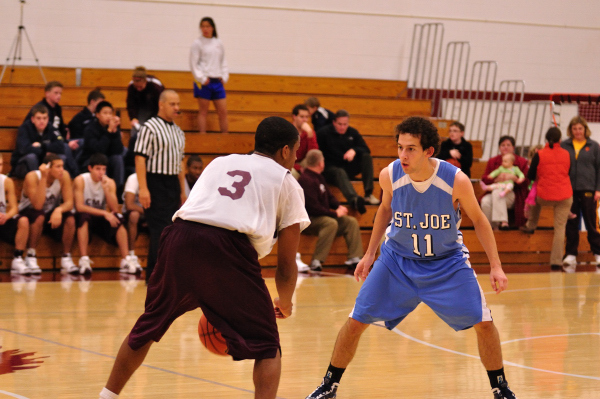 Today, the CGA Varsity Basketball Team played John Glenn High School at Culver Academy. The girls fought hard, but never got the upper hand. During the last quarter, the Eagles closed the score gap to within a few points, but the final score was Culver 48 and John Glenn 55. I’ve posted some photos here; find more at www.culverphotos.com.